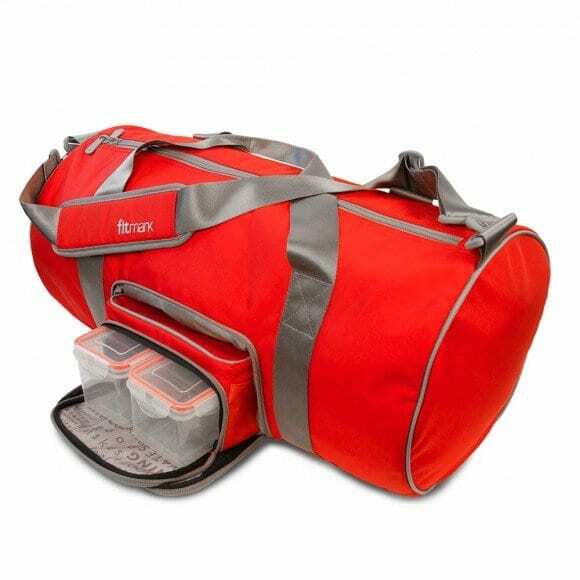 Duffel bags are often one of the most versatile bags that most of us can use on a day to day basis. A duffel bag can be used for tossing a boat load of gear for last minute car trips, planned out adventures involving trains, planes and automobiles or your daily visits to the gym. 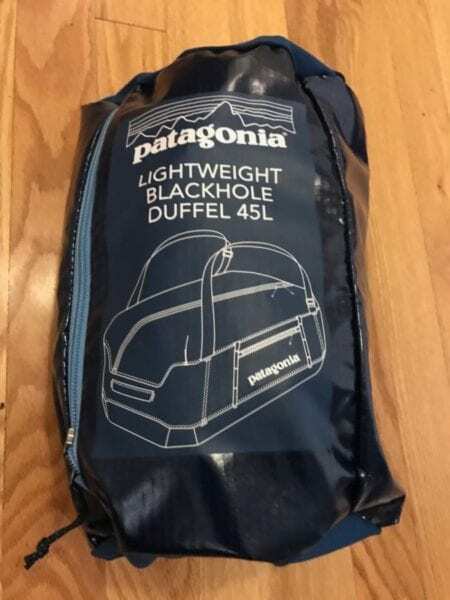 The Patagonia Lightweight Black Hole Duffel 45L is part of the new Lightweight Black Hole lineup that was born from Patagonia’s original Black Hole lineup that has been a fan favorite among all types of adventurers. One of the main differences between the new lightweight series and the original Black Hole series is that the material used in the new version is far lighter and thinner than the original. 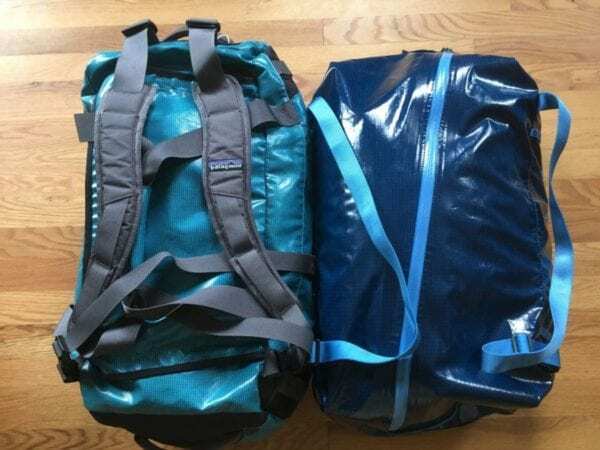 For comparison reasons, the original Black Hole Duffel 45L weighs 765 grams (1 lb 11 oz) vs. the new Lightweight Black Hole Duffel 45L weighs 510 grams (1 lb 2 oz), which is a 33% reduction in weight. The lightweight Black Hole Duffel has a 210 Ripstop denier vs. a 900 Ripstop denier in the original. The Lightweight Black Hole also features a TPU-film laminate and a DWR (durable water repellent) finish to help keep your gear protected from the elements and prevent wear and tear to the bag. 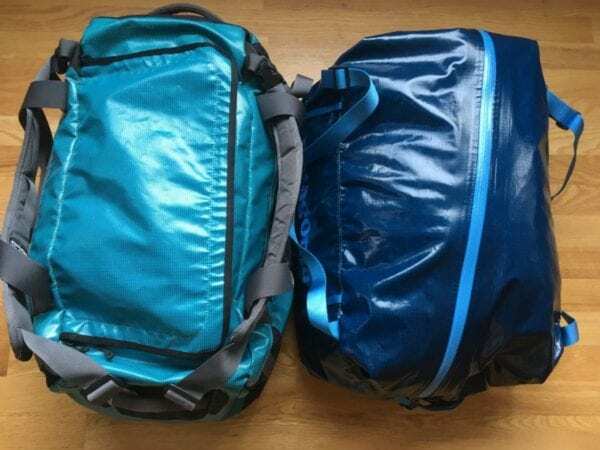 Depending on your use and needs of a duffel bag, the reduction in weight and material may or may not matter. 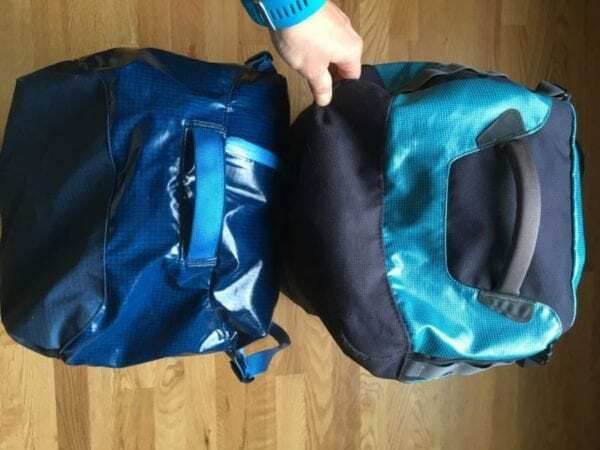 A few other key differences in the original Black Hole Duffel and Lightweight Black Hole Duffel is the strap designs, with the Black Hole featuring padded, beefier straps that allows you to carry the bag as a backpack for longer periods of time. There is also burlier daisy chains on the outside and a reinforced bottom material. On the inside, the Black Hole Duffle features internal mesh compartments along the lid and an internal and external zippered pocket. The original Black Hole duffels are available in up to 120L and are available with wheels too. The main advantage of the Patagonia Lightweight Black Hole is its’ portability. 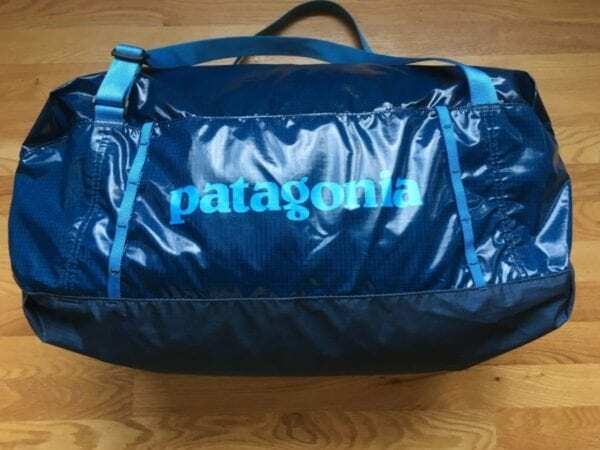 The Patagonia Lightweight Duffel 45L can pack into its’ own internal zippered pocket. 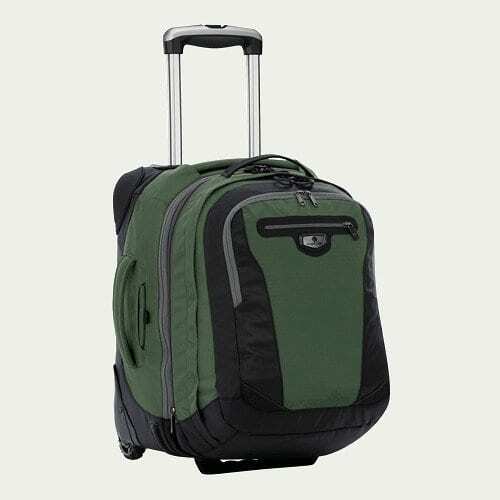 This feature makes this duffel ideal for trips in which you may come back from a trip with more than you left with or if you have a trip in which you need to downsize on certain segments of your trip, ie an overnight excursion. There is a loop with a clip that allows you to have a carry strap for the bag once packed down. This also can double as a clip for keys with the duffle is out of the zippered compartment. 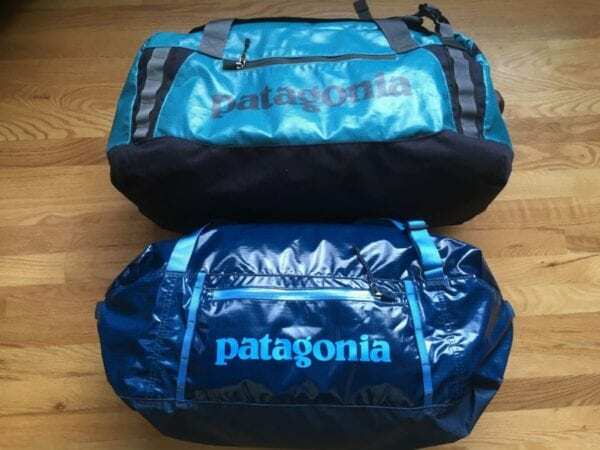 The Patagonia Lightweight Black Hole 45L roughly measures 26″ long by 14″ wide (measured along the bottom) and 9″ high. When it is packed down into its’ pocket, it is 11″ long by 7″ wide and 3″; it can be further scrunched with a compression strap to fit in even a smaller space. 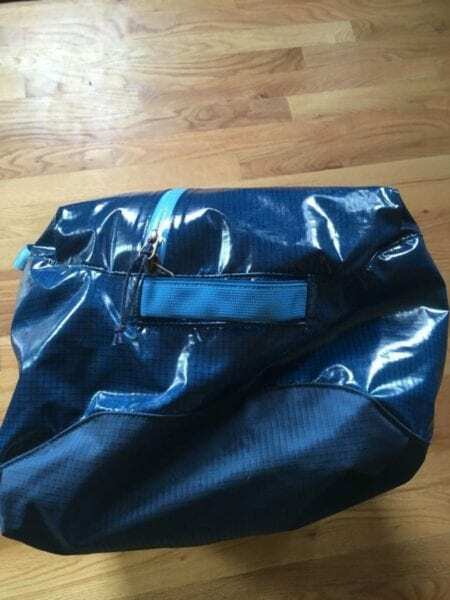 The exterior of the duffel features a zipper on one side that access the internal zippered compartment. This allows you to retrieve key items without digging through the body of the duffel. The pocket is generously sized, as this is what doubles as the carry sack. The Patagonia Lightweight Black Hole Duffel features a off-set or horizontal zip. This allows you to open the bag wider at the two corners than a traditional center zip, which I found nice to dig out items. The duffel can be carried over the shoulder, with one hand, or worn as a backpack (my favorite). 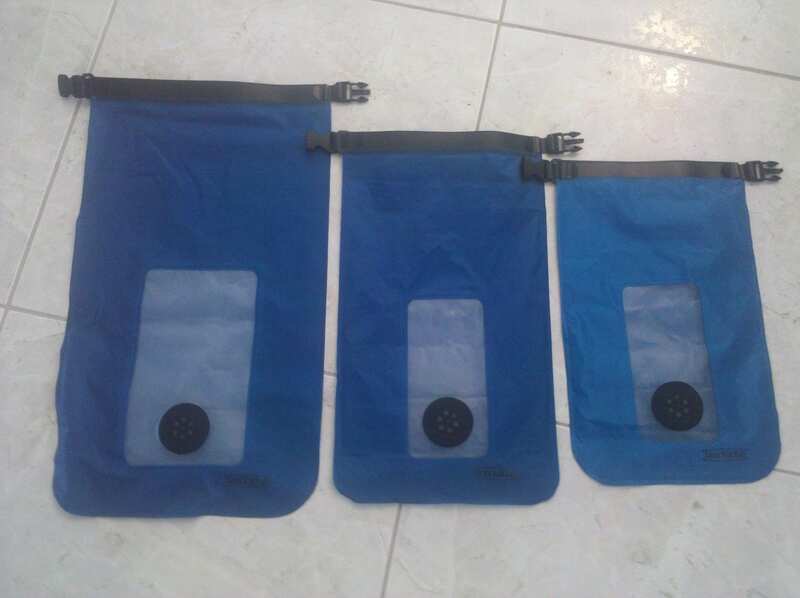 The bag also features grab handles on both ends of the bag to easily pull the bag out of an overhead compartment on a plane or a trunk of the car. Micro daisy chains round out the list of features and allow you to attach gear to the outside with a carabiner if needed. 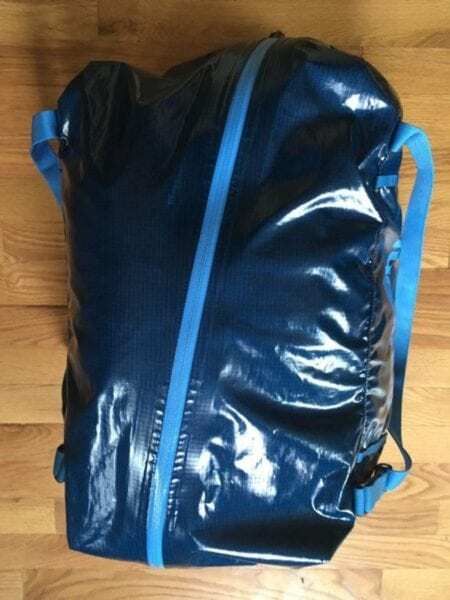 I found the Lightweight Black Hole 45L Duffel to be a good value for what you are getting for a duffel, as it protects your gear, is designed for wear and tear, and is lightweight. The duffel tested has a price of $99 which is on par with other high quality duffels. The Lightweight Black Hole Duffel is available in four colors: Big Sur Blue (featured above), Black, Craft Pink, Sporty Orange, and True Teal. 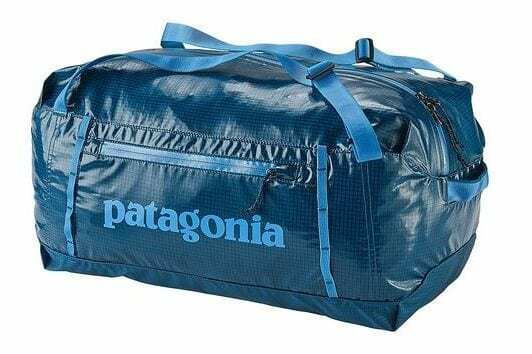 The Patagonia Lightweight Duffel is also available in a 30L option for $79. Other items in the Lightweight Black Hole series include a Gear Tote 28L, Cinch Pack 20L, and Pack 26L. Another AGR tested had the Lightweight Black Hole Pack 26L for a few weeks, however they weren’t a fan as they felt that the pack in black looked like a cheap cinch rope backpack that you commonly get at races as swag. The Patagonia Lightweight Black Hole series is a great choice for those looking to save weight while traveling. I like this lightweight lineup, but I honestly like the original line better. If you’re focusing on general car or air travel without having to carry your gear around for an extended time, it’s nice to have a little more material to depend on. If weight of your luggage is at the top of your priority list, the Patagonia Lightweight Black Hole series is the perfect option.